Rare in Montana, where it is known from a couple dozen fens and wet meadows in the northwest corner of the state. Its viability in the state generally does not appear to be at risk from any human-caused impacts at this time. CommentTrend data are unavailable. 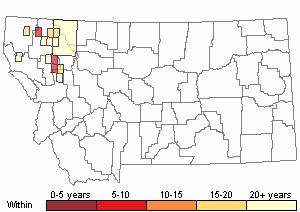 Habitat generally appears to be stable and it does not appear likely that severe declines have occurred, though it is possible that minor declines have occurred or may be occuring across the species' range in Montana due to drought conditions or other factors. Score 6 to 10 total points scored out of a possible 19. Adder's Tongue is an herbaceous perennial that is up to 20 cm high. Each plant has an erect, leafless stem that is 2-15 cm high and which branches into a single leaf-like, ascending, sterile blade and into an erect, spike-like fertile stalk. The sterile blade is elliptic to broadly lance-shaped and 2-8 cm long with entire margins and a rounded to pointed tip. The upper portion of the fertile stalk has 2 rows of contiguous spore-bearing sacs on one side. Producing spores in June - early July; sporophores persisting. There is no other fern ally with a single entire-margined blade. 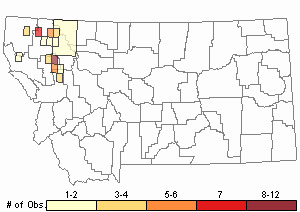 In MT restricted to Lincoln, Flathead, Lake and Missoula counties; BC to NL south to CA, MT, IA, and MD (Lesica 2012. Manual of Montana Vascular Plants. BRIT Press. Fort Worth, TX). Wet meadows, margins of fens, and gravelly moist soil in the valley and montane zones. Douglas, G. W., G. B. Straley, and D. Meidinger (eds.). 1989. The vascular plants of British Columbia. Part 1 - Gymnosperms and Dicotyledons (Aceraceae through Cucurbitaceae). Ministry of Forests, Victoria, BC. 208 pp. 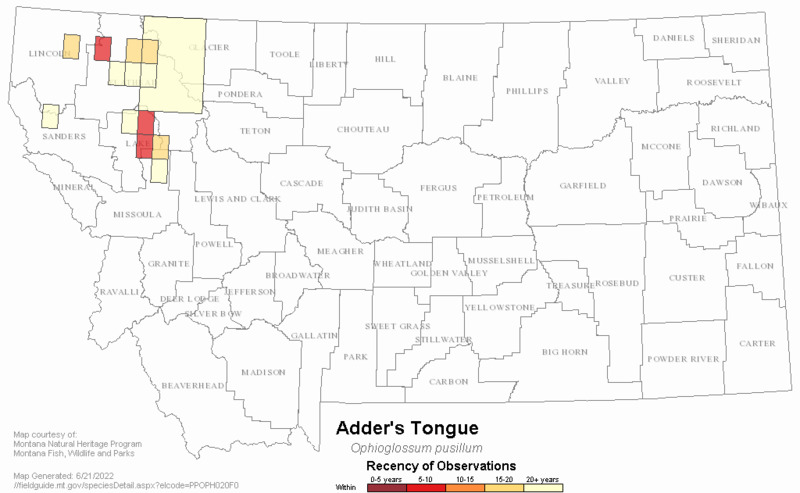 Web Search Engines for Articles on "Adder's Tongue"